Sewers are the summit of human civilization and taxation is the price of civilization. So we are supposed to pay sewer tax, right? No, not really. In this post I will explain how space settlements could fund a sewage and waste water treatment system without having to collect sewer charges. The first component is what economists call fixed costs, i.e. they do not depend on the actual usage of the system. 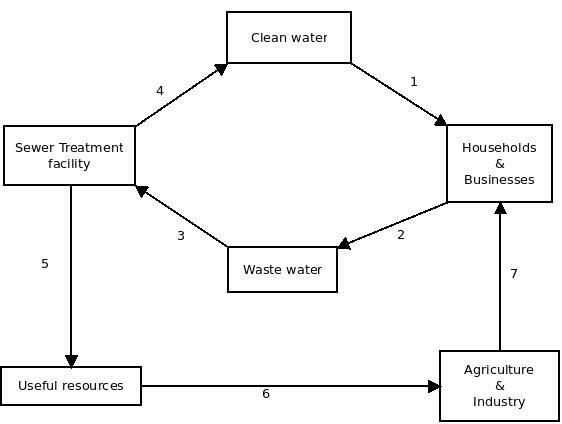 The second component is variable costs, as they are proportional to the quantity of waste water processed by the system. A fair system of funding sewers will charge people proportional to their use of the sewage. However, in practice it is hard to measure how much waste a person or household or business contribute to the total amount of waste water. Hence many local authorities resort to charge a fix rate to their residents, which is mostly to the disadvantage of the less affluent parts of the population. People will consume clean water and produce waste water, this is reversed in the Sewer Treatment Facility. However, one will roughly produce as much waste water as one consumes clean water. Since the price of clean water will cover the cost of producing it from waste water, there is no real need to have a separate charge for the sewer. Also billing people for the water they consume, will encourage them not to spill water they do not need. However, clean water is not the only thing produced by the purification of sewer water. In fact sewers are rich in a wide variety of useful substances. For instance, sewage sludge is estimated to contain up to millions worth of gold and other precious metals. Though the exact amount might vary from locale to locale, reclaiming these treasures is at least something to consider. Precious metals are, however, not only the useful resource with could be reclaimed from sewer water. Sewage sludge is rich in phosphates and nitrates, the very components of fertilizers. Recovered phosphates and nitrates could be sold to farmers to raise additional revenue. A sewage treatment plant in Germany has built to remove calcium, aluminum salts, iron and phosphates from waste water. The recovered calcium is used as a gypsum source for building materials and the iron is sold. Given that sewers are designed and built to collect and move human excrements, it is not surprising that waste water is rich in carbon compounds – in particular methane, carbon dioxide and carbon monoxide. Like nitrogen and phosphor, carbon is valuable as it required for growing crops and hence carbon dioxide could be sold as well to farmers. So through the sale of clean water and recovered minerals, a space settlement should be able to raise the revenue to fund a public sewer system without having to resort to levying taxes on its residents.